Competition for most innovative companies in digital innovation. “Concours d’Innovation Numérique” is sponsored by the French state to support the best innovative projects in digital transformation. Its ambition is to accelerate the developments of projects based on digital technologies by sponsoring a significant part of the project. ICA is part of the six Fintechs chosen by Société Générale to integrate their Global Markets Incubator. ICA has been chosen by Société Générale to join their capital markets accelerator. We are pleased to bring our disruptive technology to this major global markets player. Starting in February, ICA and Société Générale will work together to co-build high performance solutions for big data analytics and visualisations technology. France Fintech and the transformation consulting firm Julhiet Sterwen have released their 2019 RegTech White Paper in which you can find ICA. They present their view on the fast growing RegTech environment and the leading RegTech in France . Let us outline for you our successful bank-finTech cooperation: together we built a modern xVA platform based on big data technologies! Why do you believe that CIBs (corporate & investment banks) need to innovate to remain relevant in today's financial value chain? What technologies do you believe will be most influential the transformation of CIBs in the near future? What are the key elements holding CIBs back from implementing new technologies and operational initiatives? Why are you involved in CMIS 2018 and what is your message to the industry? We also made available an excerpt of the presentation given by Santander and ICA on 27/09/18 at Capital Market Innocation Summmit in London. Please register with us for the full presentation. Santander and ICA presented at the Capital Markets Innovation Summit in London their bank-fintech and innovation story. Stephane Rio, CEO and founder of The Independent Calculation Agent (ICA) giving insight on how new technologies can radically change approaches to xVA and other pricing and risk calculations, in collaboration with Risk magazine. Technology at the service of XVA or ‘XVA as a service’? Bpi France & Business France selected ICA with 11 French Techs to join the French Tech Tour America 2018 in New-York & San Francisco dedicated to the most innovative and relevant projects ready to expand into the US market. This paper outlines a simple technique that allows to incorporate the effects of correlations between market data and defaults when calculating members of the xVA family, thereby enabling the ”measure” in an efficient way of what is known as Wrong Way Risk (WWR). "One week, one tech" on hello Finance: this week ICA is on! Yanling Xi - Hello, welcome to today's One Week One Tech, presented by Périclès Group, together with Finance Innovation. Today we are with Stéphane Rio (CEO & Co-Founder of ICA), in order to present to you the company ICA. Stéphane, could you introduce to us quickly about your company? Backing of the Worldwide Competitivity Cluster FINANCE INNOVATION. 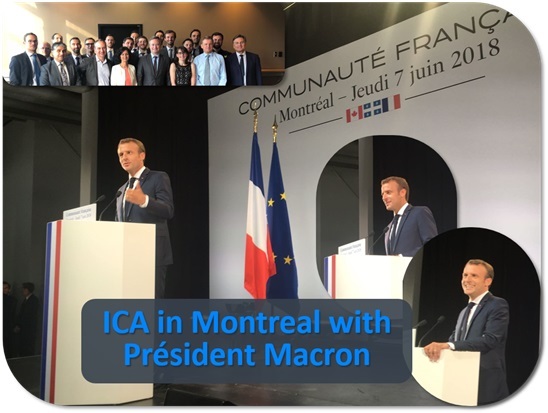 ICA is honoured to have been part of the delegation of JB Lemoyne (French Foreign Affairs secretary of State) on a mission with 12 French tech companies to meet the AI crowd in Montreal,with President Macron joining the delegation ahead of the G7. Join us on April 9th at "Fintech R:Evolution"
ICA is participating in the Fintech R:Evolution event organized by France Fintech on next April, 9th at Station F in Paris, with an inspiring "Destination: Excellence" motto for this 4th edition. Let's meet and discuss how we can build together the future Fintech ecosystem! In this paper, Thibaut Montes, Vincent Lemaire and Gilles Pagès from the Probability, Statistics and Modeling Lab (LPSM - Paris 6) propose new weak error bounds and expansion in dimension one for optimal quantization-based cubature formula for different classes of function. They propose an extension of this expansion in higher dimension for the first time and a novel variance reduction method for Monte Carlo estimators. 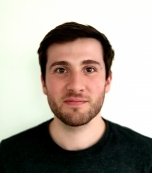 Thibaut's research is used in ICA's option pricing algorithms.